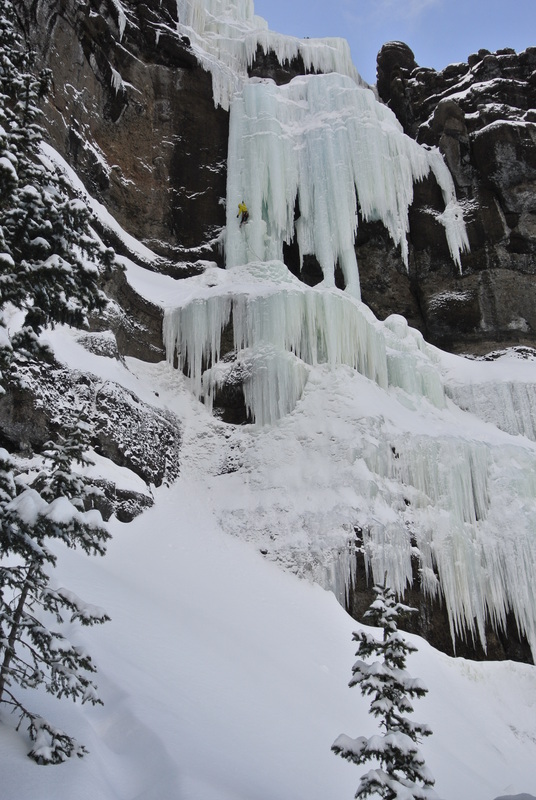 Ice Climbing; a love story. So fair warning folks; this may turn out to be more of a cloying love letter to ice climbing than a legitimate trip report. Also, it’s pretty damn self-centred. Tough. You’ve been warmed. The cast: Stu, Ian, Alfred, Artem, Tom, Tiana and Katie. Just when my knuckles had finally recovered from the thrashing I gave them over Christmas and New Year, and just when my internal fear-and-suffering sponge was beginning to run dry, our heroic leader, Ian Dusome, suggested an ice climbing trip for the horribly miss-named ‘reading week’. Honestly, I couldn’t imagine a better suggestion. 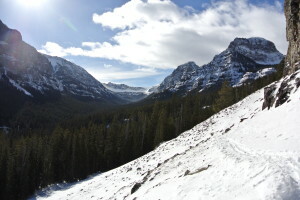 Then Hyalite Canyon, near Yellowstone, was settled upon and my stoke-o-meter boiled over. So, Friday afternoon sees me franticly packing (and unpacking to check if stuff’s been already packed, or lost) then sitting on my bag out the front of my house, uncontrollably twitching, waiting for Alfred and his pimpin’ new van. I hear you ask: ‘How’s Alfred’s new Delica?’ a god send. More on this later. Long journey, write essay, boring, crossed a boarder, nervous, Washington, ninja camp, Idaho, ‘Hey, there’s snow!’ Montana, Bozeman, Yahooo!, food shop, hmm trail mix, To Hyalite! So the evening of Saturday the 15th we rock up in Hyalite, and honestly I’m underwhelmed: it’s dark and as far as I can tell we drove all this way for a snowy car park and some trees. 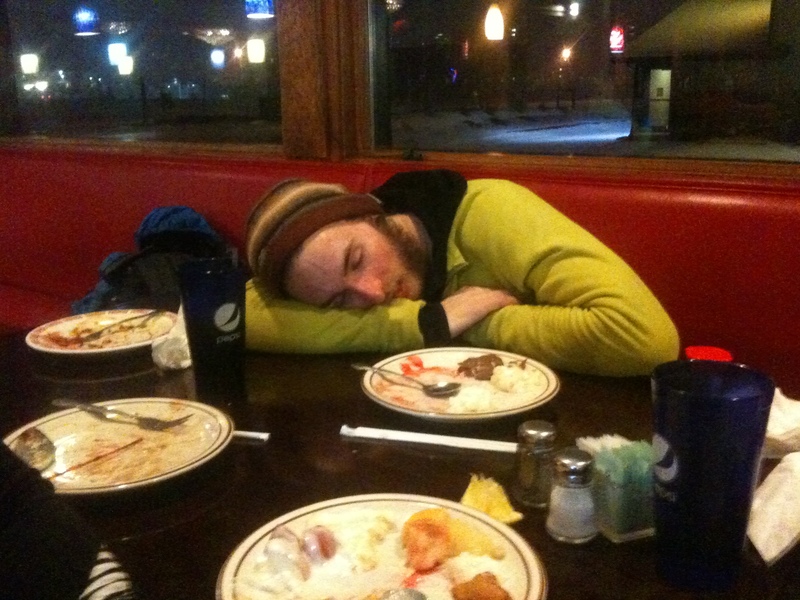 Then we slept. 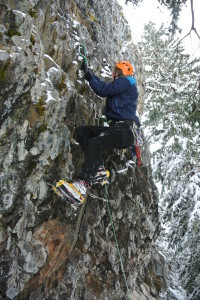 Sunday: don Battle Suits (the suits we use for climbing; contrast action suits), we’re headed for Twin falls area to find our feet, get some swings in and whet the appetite. The routine is a quick breakfast (trail mix) and once everybody’s ready, take of as many clothes as you can stand and start walking. On the approach we get off route, and I find myself at the front of the group for a time, post holing so deep the snow rattles my bojangles. I can feel that sponge beginning to moisten. I also discover what skiers would mean when they say ‘it’s powder so deep you could drown in it’. 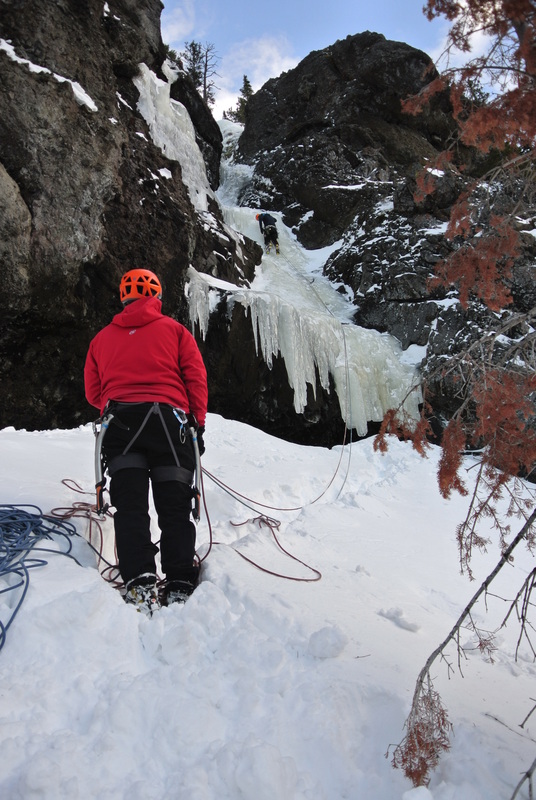 Twin falls was the longest approach, and offered us a broad ice curtain of climbs all around WI3. After Ian and Artem throw up a couple of top ropes we start getting some laps in, and the simple joy of movement on ice stars to come back. Sink your pick, move the feet up, stand up, lock off and repeat. A routine that offers incredible satisfaction as you begin to move up stretches of ice that intimidate from the bottom. We climb wet ice into dark and it’s a cold and windy day, and the gloves freeze solid and I forget to eat and have no water. Life doesn’t get much better. Day two: mummy cooler area. And we get to do some more postholing! (Now there’s murmurs in the group about ‘I shoulda brought my skis’). This was a really lovely area, in a spot half way up the canyon side, we get our first clear views and we can see there are amazing aesthetic drips all around; thin gullies and fat flows and not-quite-touching down daggers. A real playground. We spent a great day climbing in the sun, and it’s a day I’ll never forget as, after some nudging from Ian and Artem, I put in my first lead on ice. An ugly gully, with a section of thin ice and a turf placement or two at the top; grade A stuff in my book. So that night we get our first real taste of what the Delica has to offer. We stuff ourselves with food, quick style, and jump in the back of the van (all seven of us in Alfred’s bed, the lucky devil), then while away the night watching films in warmth and comfort. Dear Alfred, Prince of Squamish, your van is awesome. Day Four: best day of the trip? Kick things off with an Incredible American breakfast diner experience. Happy days! Ice climbing soliloquy: So the realities of leading ice had been heavy on my mind before leaving for this trip. I had thought to myself I’d like to do some leading, but at the same time was acutely aware that to fall could easily end up with broken legs or worse. However, as the balance of risk is stacked, so that also amps up the possibilities of reward. Day four was the day these realities again became very present to my mind. I got on switchback falls, at ‘sustained WI3’, which would prove to be my first challenging lead and, to me, it’s routes like this that makes climbing so special and unique. I felt strong right out the gate, having fun, moving well and ramming screws in. Then the ice starts to get brittle, I think ‘right, no worries. I’ll stick a nice long 22cm in’ and I keep moving. Then ice gets aerated and brittle; I try a screw and it wiggles around like I’m placing it in sand. I pull it out. Ok, cool, keep moving. I say to myself ‘it’s chill’, but I start to feel nervous. Then I find solid, hard, quality, dreamy, beautiful ice. Awesome. I take a swing at it, a smile on my face, and the pick punches through its thin, delaminated veneer to the airy cavity and rock beneath. Bugger me. I start puffing. As I gently move up, 5 meters above the last screw, I reach out to the top of the climb and sink my tool shaft deep into turf and stand there, front points in delaminated ice, with relief running down my inner thigh. That was a really special moment for me, and one that sums up what I think is tremendous about climbing ice. It takes self-assuredness to get on the climb at the bottom, to be aware of the dangers and to decide they’re something you want to take on. The reward of measuring yourself up against something and testing your mettle in that way are just tremendous. I guess basically what I’m saying is ice climbing is nice because you never lose, because you pick battles you can always win. Though if you get that calculus wrong, you get messed up. Day four: We meet Conrad Anker (climbing rock star) in the parking lot, and he fully approves our holiday, even going so far as to thank us (that’s right, thank US) for coming down and checking out Hyalite. Then we gang-lead the socks off of some stuff. We really have a cool day, and it’s a pretty big step for the group with everyone getting on the sharp end. Until, and given where we were maybe we should have seen this coming, the goon-squad shows up. These three guys walk up, and seeing one of them standing at the bottom of a WI4, I say something along the lines of ‘If he dies, do you think I can get his ice tools?’. Those words were so foreshadowing I regretted them sincerely. We watched the man take a twenty meter whip onto his only useful ice screw. If it had blown he would have died. Thankfully, the belayer (through some epic belaying) caught him just feet from the deck and the only injuries were shock all round and the belayer taking a crampon front point to the calf. Quite an amazing outcome. We dialled it back for the rest of the day, and I think we were all left with a bit of a sick feeling and something to think about. We spent the next day sitting in commercial hot springs, soaking and eating a Chinese buffet that made us want to throw up. Though despite those feelings, the crazier ones in the group (read, those that can actually ski…) capped the night off with some mad (read, awesome) skiing behind Ian’s truck. Artem set the speed record at an unmentionable number. The final day was a super satisfying conclusion. Me and Alfred found our way back to genesis wall (where the guy fell) and had a brilliant wrap up. Alfred got a really legitimate ice lead in, I got a taste of the mixed-climbing-on-lead bug (also, proper awesome) and I think both of us got to leave Hyalite in a really good place. Go team! Que the massive drive back…. Again, thanks everyone for a great trip; taking care of each other and having a blast. And Ian, you’re the man for organising this. 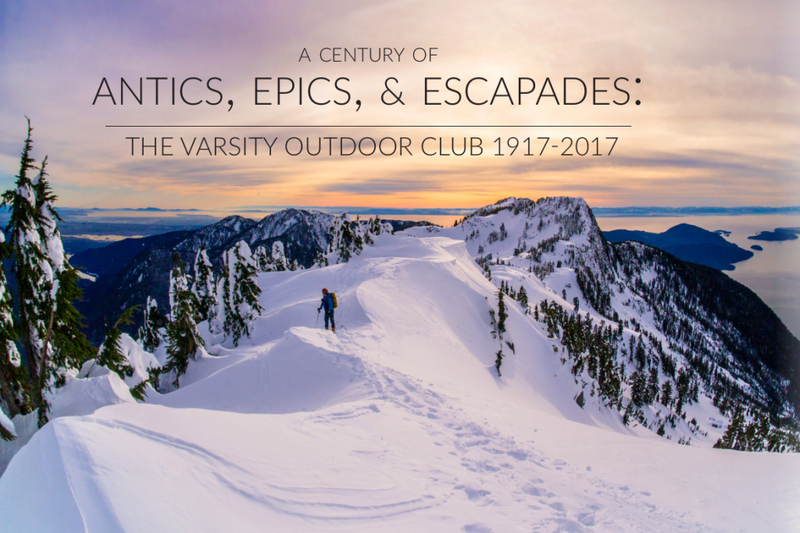 This entry was posted in Climb, Trip Reports and tagged christmas, Climb, climbing, dry, Epic, Face, fall, ice climbing, leading, powder, Running, ski, skiing, Snow, Snowy, Squamish, Suffering, washington, WI4. Bookmark the permalink. Wow, totally awesome! 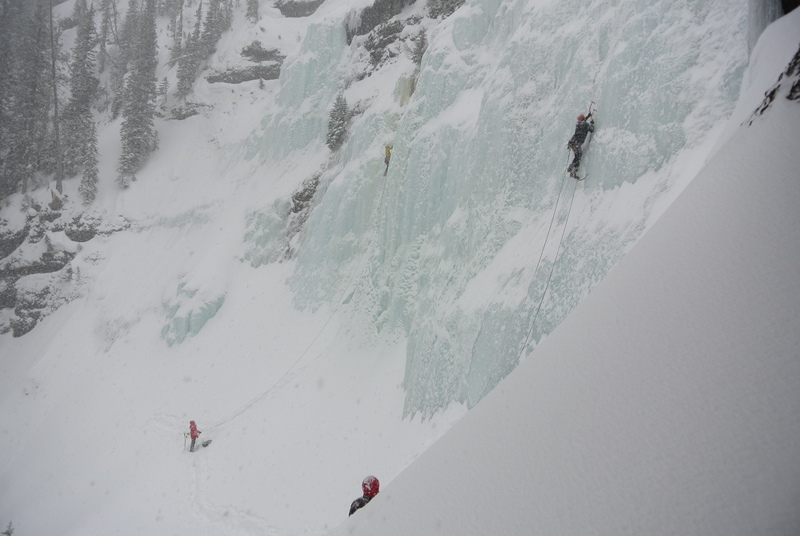 Sick ice climbing, and you got to meet Conrad Anker!